A full grown mouse can squeeze through a hole the size of a dime and a crack that is only ¼ inch. Unlike other pest control companies, part of our service is to rodent proof your home using “exclusion” techniques. The first thing we do is make a thorough inspection inside and outside. Service lines that enter the house (i.e. gas pipes, water pipes, cable T.V., etc.) are all checked. Inside, our experienced technicians will inspect under all sinks, washer and dryer areas and all other areas where service lines could provide rodent entry. 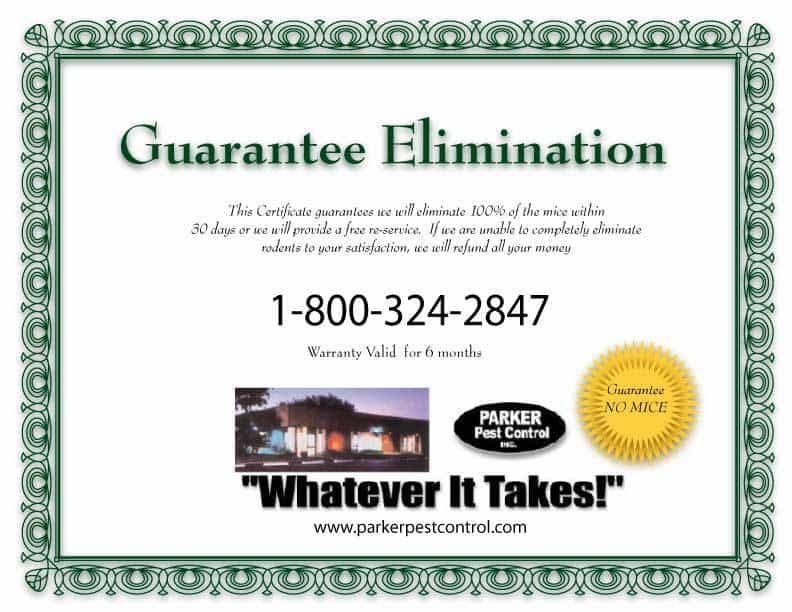 A Parker Pest Control Technician Inspection will reveal areas where mice can and probably will enter. Mice can transmit dangerous diseases such as Hantavirus Pulmonary Syndrome (HPS). Do not handle mice with your bare hands. Ask us for insructions on how to properly clean up mice urine and droppings. All small cracks and holes are closed up using a special material called “stuff-it”. It is a copper mesh product that will not rust and mice cannot chew through it. Larger holes and cracks will be pointed out to our client for them to repair themselves. We like to use glue boards because they will catch more mice, they are easy to dispose of and they are non-toxic. There are some real tricks to using them effectively and we know all the “tricks of the trade”. When our technician arrives for your scheduled appointment, please show him all the areas where you have observed rodent evidence. Also, please remove all items out from under all sinks so we can perform our exclusion procedures. Mice will usually inhabit the attic space and will migrate down through the walls and then into the house. We use a special rodenticide bait in the attic which will provide long term control. Inside we use only trapping devices and no toxic baits at all; unlike most other pest control companies. The use of baits inside a home is irresponsible, a safety issue, and if a rodent dies inside the home after consuming a lethal dose of rodenticide there could be a horrible dead body odor for several weeks. Any traps used inside that need to be placed in an area where pets or small children have access to them will be used inside a trap station. For mice, we perform one treatment and guarantee it for 6 months. Click on certificate for more information. Ask any other pest control company for that guarantee and they will probably laugh. If you compare the cost of our competitors on-going service over a period of 12 months, you will find our price is a fraction of theirs. So why pay more? Get it done right the first time and forget it. Other companies that use only baits and traps may control the problem temporarily, but without rodent proofing your home, mice can come right back in. This is why they try to sell you a costly monthly program. We find if you do the job right the first time,one service is all you need. Please give our treatment at least 2 weeks to be 100% effective. If you are still seeing rodent evidence after 2 weeks, or any time during the 6 month period, please let us know right away. If a re-service is necessary within the warranty period, it will be at no cost to you.